A New York City man was sentenced to 2 1/2 years in prison Wednesday in what experts said was the first federal conviction for profiting from the illegal sale of human organs. Levy Izhak Rosenbaum, and Israeli native who resides in Brooklyn, pleaded guilty in October to brokering three illegal kidney transplants for New Jersey-based customers in exchange for payments of $120,000 or more. The 61-year-old showed little reaction to the sentence, handed down by U.S. District Judge Anne E. Thompson. He was swarmed by well-wishers who had packed the federal courtroom in Trenton to show their support. Rosenbaum arrested in July 2009 in a sweeping federal case that became the largest corruption sting in New Jersey history. Prosecutors allege Rosenbaum would buy organs from vulnerable people in Israel for as little as $10,000 and sell them to desperate patients for more than $100,000. The transplants took place at top U.S. hospitals, including at the Albert Einstein Medical Center in Philadelphia. Assistant U.S. Attorney Mark McCarren said Rosenbaum engaged in the practice for up to a decade and made millions by exploiting desperate recipients and paying donors paltry sums. "The defendant has attempted to portray himself as the 'Robin Hood' of kidneys," McCarren said. "There is only one thing that his story has in common with Robin Hood, and that is, it is fiction." The daylong sentencing hearing featured divergent views of Rosenbaum's conduct, from a man who said he felt taken advantage of when Rosenbaum paid him just $25,000 and coached him to lie about his kidney donation, to others who said Rosenbaum had saved their lives. Rosenbaum's lawyer, Ronald Kleinberg, argued that his client had admitted engaging in the sale of kidneys but did so only to save lives. Several of his supporters said he was a revered member of their Orthodox Jewish community in the Borough Park section of Brooklyn. "There are no victims here," said Rachel Warshower, who traveled from Brooklyn to support Rosenbaum, whom she called a family friend. "The donors are happy and the recipients are happy; Izhak Rosenbaum is not the monster the media has made him out to be." U.S. Attorney Paul Fishman said Rosenbaum's conviction was the first under the federal statute involving the black market sale of kidneys from paid donors. Rosenbaum was arrested after he tried to set up a kidney sale to a man posing as a crooked businessman but was actually an informant cooperating with federal authorities. He was among more than 40 people arrested in the dual-track investigation into money laundering and political corruption. Defendants included politicians and rabbis in New Jersey and Brooklyn. 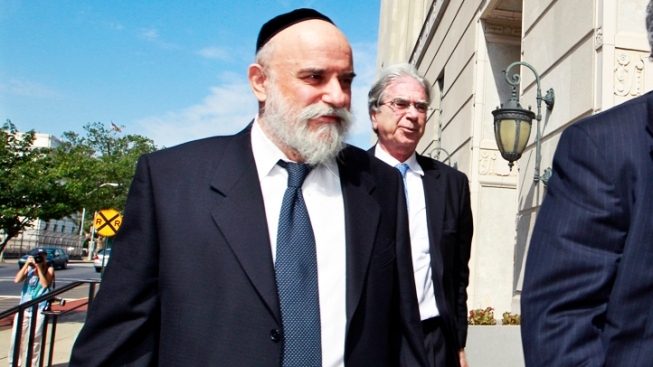 Rosenbaum is not a rabbi, but the image of rabbis illegally selling kidneys garnered international headlines at the time of the 2009 sting, and made its way into the routines of late-night comedians for weeks afterward. Rosenbaum testified Wednesday that he had spent the three years since his arrest thinking about what he had done. "It was wrong, but I thought the cause was good," he said. "I can assure this court I will never do this again." Earlier Wednesday, a doctor with Albert Einstein Medical Center testified that Rosenbaum brought as many as 15 pairs of donors and recipients to the hospital for transplants from 1999 to 2002. The physician, Radi Zaki, and Beth Duffy, the vice president of health care services at Albert Einstein Healthcare Network, testified separately that Rosenbaum always presented himself as a legitimate facilitator of donor matches for Israeli patients and provided all the correct paperwork for the donor matches. Rosenbaum could face deportation after he serves his sentence, due to begin in October.